An automatic watering system for outdoor plants makes life easier, and saves you tons of time. It’s also very easy to install your own, and doesn’t take much time (it’s totally worth every second!). 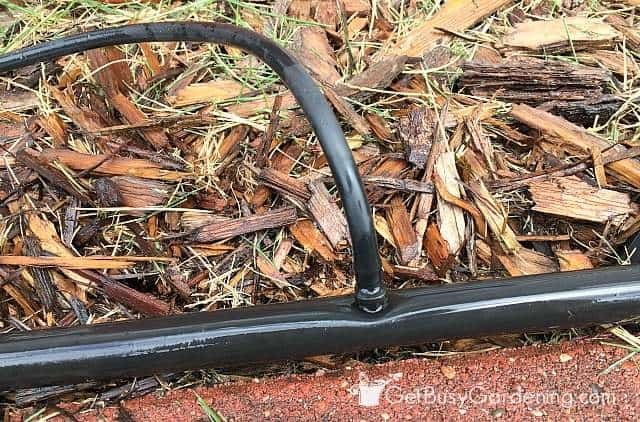 Follow these easy step-by-step instructions to install a DIY drip irrigation system for potted plants. We have an area behind our house that gets full sun that I always thought would be perfect for growing, but it’s under the eaves of the house so it doesn’t get much water. My husband put a few pots of peppers there last year, but watering all of those pots became a major chore in the heat of the summer. We had a drought last year, so we had to water these pots a few times a day. Not fun! 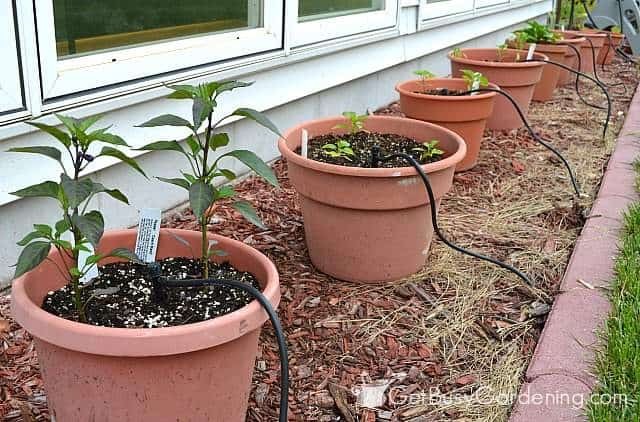 My husband told me he wanted to line the area with pots of peppers this year, so we decided to try adding a drip irrigation system to make watering potted plants easy. It turns out, putting in a DIY drip system for potted plants is just as easy as it was to add overhead sprinklers to our greenhouse. Plus we had some of the poly tubing left over from that project, so we were able to use that for this project – bonus! Think of a drip irrigation system as an automatic watering system for pots and containers. 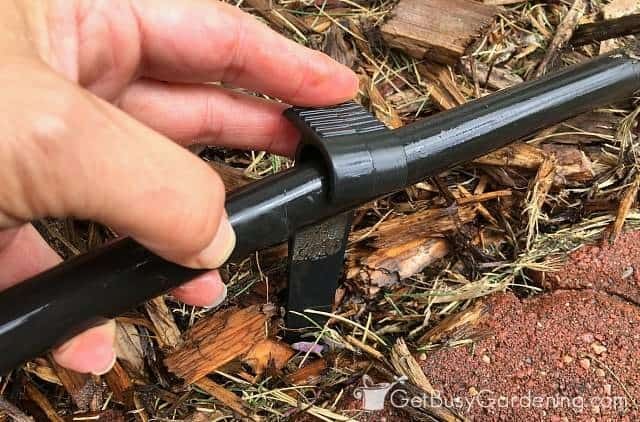 It hooks right into your garden hose or spigot so when the water turns on, all of your pots will get watered at the same time. 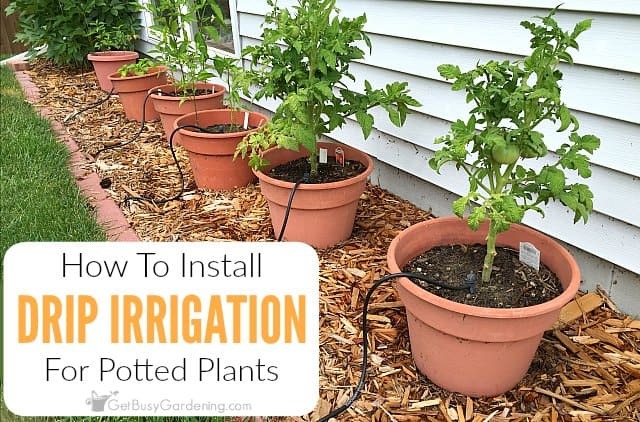 You could turn the water on manually, or set it up on a automatic timer to create a self-watering system for potted plants (trust me, drip irrigation timers are totally worth it, and it’s not very expensive to buy yourself one!). Installing a drip water system for potted plants has lots of benefits to you, and to your plants. 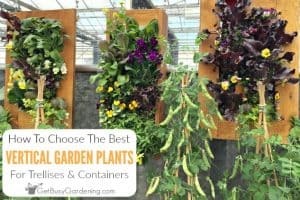 The main benefit is convenience, and let me tell you, an automatic drip irrigation system makes container gardening SO MUCH easier! Not only do self-watering plant pots make your life easier, but it’s better for your plants too, and ensures they’re getting exactly the right amount of water. Consistently watering plant pots not only keeps your plants happy and healthy, it also helps to prevent problems like blossom end rot. Healthy plants have less problems with pests and diseases, and produce TONS more yummy food for us!? What’s not to love? 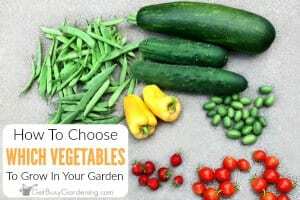 Depending on how many pots you have in your container garden, a drip irrigation kit might be all you will need to install your entire potted plant irrigation system. You can buy a smaller kit if you have 8 pots or less to water, or you can get a larger kit like this one that will work to automatically water up to 20 containers. 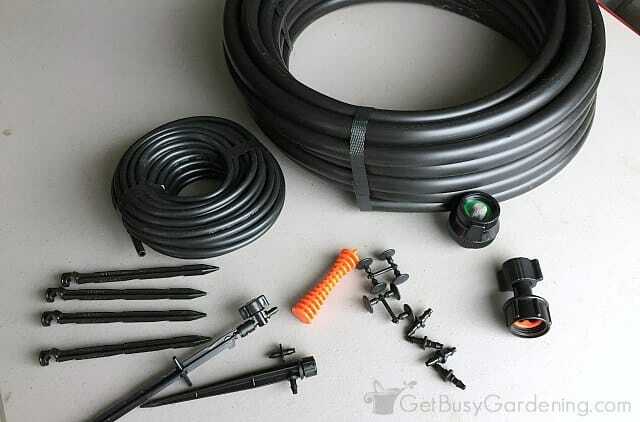 Drip irrigation kits are a great way to get started, and will include full instructions for setting everything up. Some kits even come with a timer. 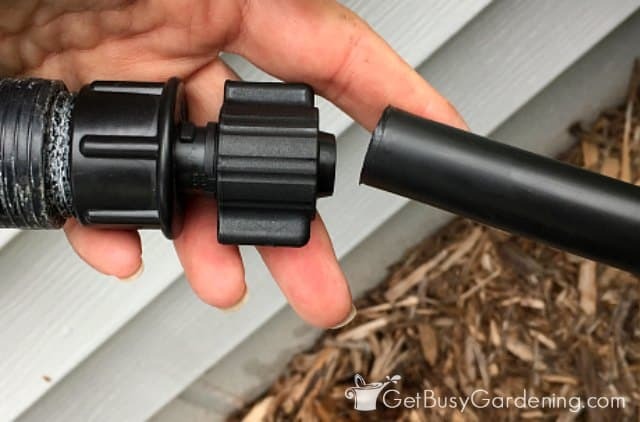 But keep in mind that even when you start with a drip irrigation kit, you might still need to buy a few additional parts (for example, most kits don’t come with a pressure regulator). So be sure to read the details of what’s included in the kit. Of course, you can also make your own custom drip irrigation system design, which is what we did for our setup since we already had the poly tubing and a few other parts to get us started. 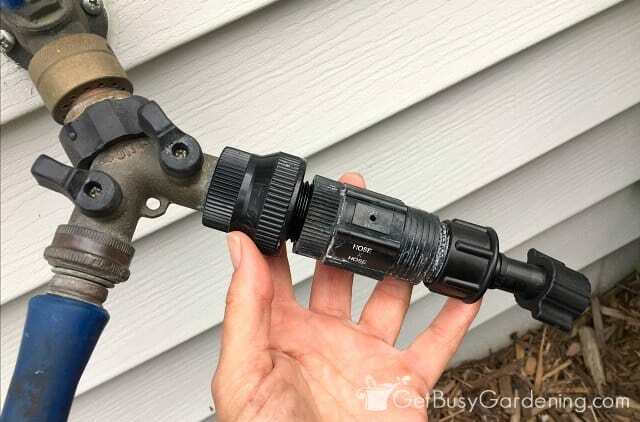 Step 1: Attach connectors to faucet, hose or spigot – It’s easier to hook everything in if you attach the connectors to your hose or spigot first. So grab the backflow preventer, the pressure regulator, and the faucet hose fitting for this step. Start by attaching the irrigation backflow preventer onto your hose or faucet spigot (it simply screws on). Next, you’ll attach the pressure regulator, and last the faucet hose fitting (this just screws on too – no tools needed!). Basically you’ll end up chaining the garden hose attachments together, in this exact order (backflow preventer, pressure regulator, faucet hose fitting). Step 2: Attach the 1/2″ poly tubing to the hose fitting – Take one end of your 1/2″ poly mainline tubing and push it into the open end of the faucet hose fitting. Once you’ve pushed it in, pull down the collar on the hose fitting piece, and tighten it to secure the tubing. You might want to kink the tubing and turn on the water to make sure there’s no leaking at this point, otherwise you can wait to test everything later on in step 7. 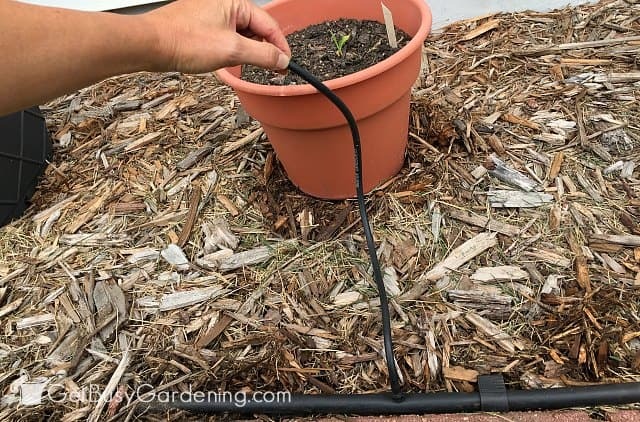 Step 3: Figure out your drip irrigation system design – The next drip system installation step is to determine how far apart the drip heads will be, so you know exactly where to install the micro tubing. Figuring out the drip irrigation design sounds hard, but it was actually really easy. We simply laid out the pots where we wanted them to be, and then laid down the poly tubing hose in front of them (Tip: let the poly tubing sit in the sun for a while to warm up first, it’s easier to lay it flat when it’s warmed up). Then we measured where each pot was, and marked the poly tubing where we needed to add the drip tube lines for each of the drippers. Once we measured it all out, we cut the poly tubing at the very end using using our PVC cutting tool (you could use a PVC pipe cutting saw to cut the tubing instead), and caped the tube with the poly tubing end cap. Step 4: Figure out how long the drip lines will be – Next we measured how long each piece of the micro tubing needed to be for the drip lines. That’s simply the length from the spot you marked on the mainline poly tubing, up to the spot where the drip head will be inside the pot. We added several extra inches to the length of each piece of the micro tubing so it would be loose enough to allow room for us to move the pots around a bit if we wanted to (which we have, and it works out really well). Step 5: Install the irrigation micro tubing – It’s easy to add the drip lines (micro tubing) and the micro sprinkler heads. 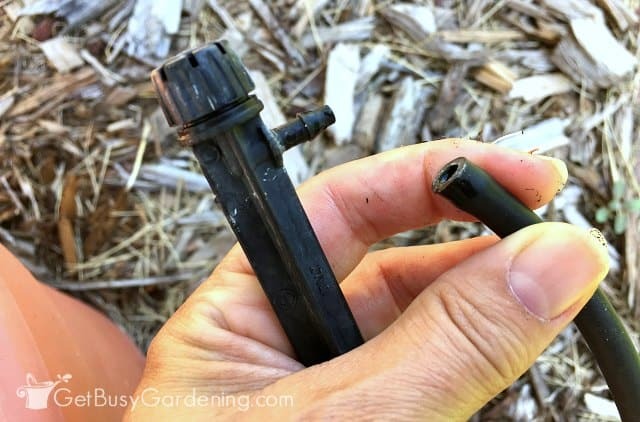 For drip line installation you simply punch a hole in the mainline poly tubing (using the drip irrigation hole punch) where you want to add the micro tubing drip lines (these are the spots you marked on the tubing in step 3). Don’t panic if you punch a hole in the wrong spot. I know that making a mistake isn’t ideal, but if you do end up punching a hole in the wrong spot… well, that’s why they make goof plugs! It’s good to have them on hand just in case. Next you’ll attach the drip line connector first to the main line tube, then attach the micro tubing drip hose onto the other end of the connector. Step 6: Install the irrigation drippers – Installing the dripper heads is super easy too. You basically just plug them into the open end of the micro tubing, and then put them into your container. Our dripper micro heads came with spikes to hold them in place, so they stay where we put them. We centered the micro heads in each of our pots, just to one side of the base of the plant(s). Be careful not to damage any tender roots or seedlings when your pushing the irrigation spikes into the soil though. Step 7: Test out your irrigation setup – Before burying the poly tubing, test everything out to make sure it’s all working with no leaks. You definitely don’t want anything leaking. At this point it’s also a good idea to adjust the drip heads. The tops of the heads twist so you can control the amount of water that comes out. We adjusted each one to make sure they weren’t spraying outside the pots, and that they were all working correctly. Step 8: Secure the poly tubing – Once everything was installed and tested, we secured the main line poly tubing into the ground with some 1/2″ drip irrigation tubing stakes. The stakes clip onto the main line poly tubing, which makes securing the tubing easy. Then we simply buried the tubing in the mulch to give it a cleaner look. Note, you can install your poly tubing behind your pots rather than in front of them like we did here. That way, the micro tubing will run up the backs of the pots, and won’t be so obvious. 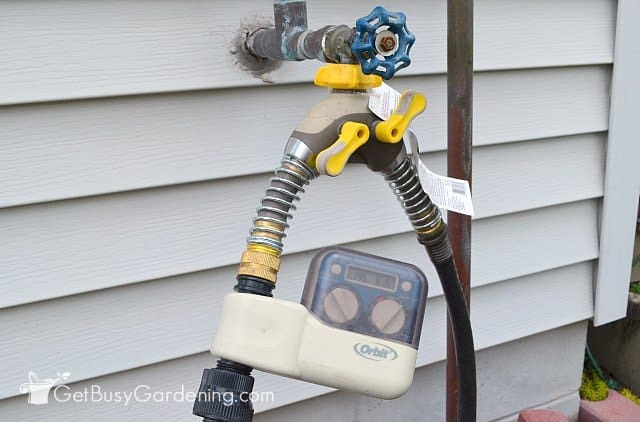 Step 9: Set the timer for automatic irrigation – Last, we set the timer on our hose garden watering timer to run on a schedule so we never have to worry about watering these pots again (which is especially nice for watering plants while we’re on vacation!). 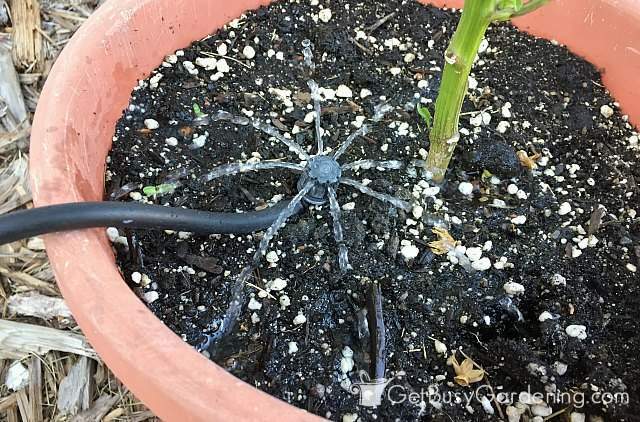 Once your automated drip irrigation system is running, I recommend checking on your pots regularly to make sure they are getting the right amount of water. Then you can adjust your timer accordingly to get it just right. We’ll turn the drip irrigation timer off when we get a lot of rain, and increase the length or how often the drippers run during dry periods. 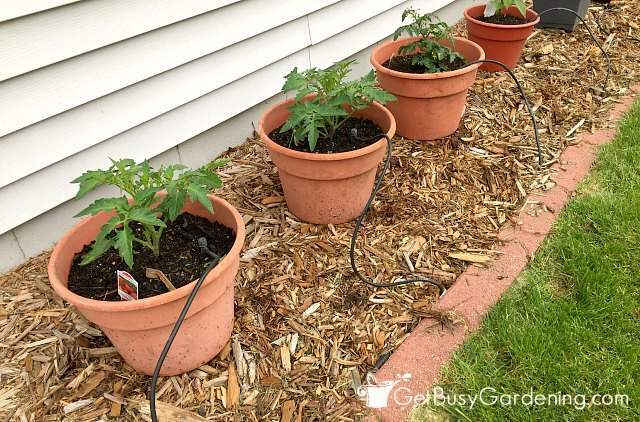 Not only is this DIY drip irrigations system great so we don’t have to water these pots, but it makes it much easier to ensure our peppers and tomatoes are getting a consistent amount of water. Hopefully this will help prevent blossom end rot, which was a problem for our container grown peppers last year. 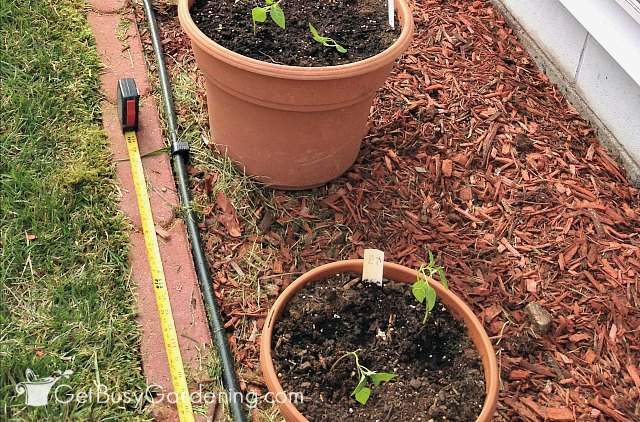 Drip irrigation systems are great for containers, as well as the garden. 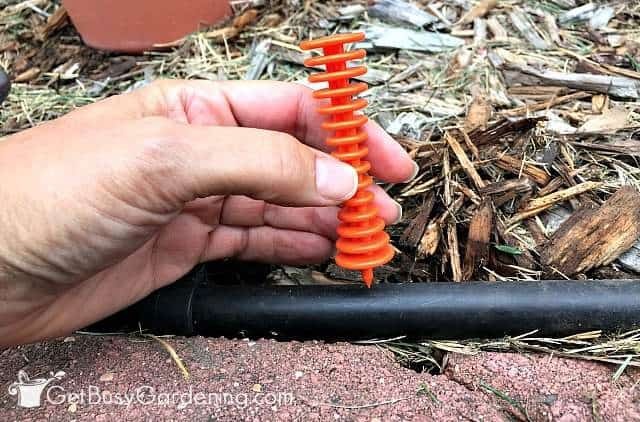 I know it seems like there are a lot of steps involved with drip irrigation installation, but trust me it really is very easy to do! Believe me, if I can do it, anyone can! 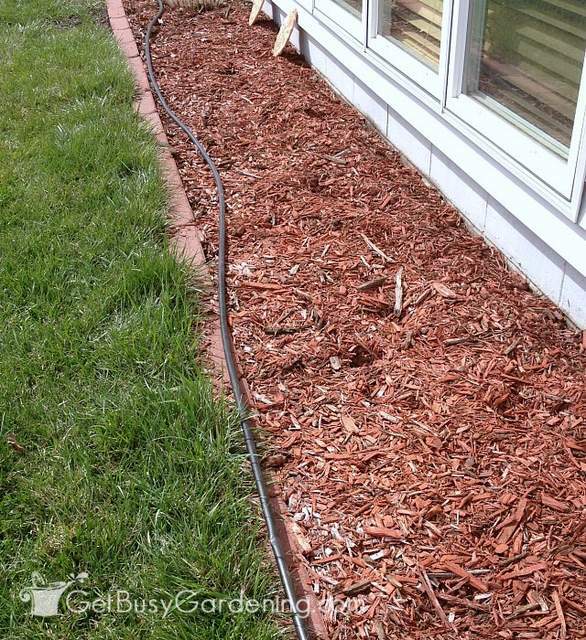 Share your tips and experiences for installing a DIY drip irrigation system in the comments section below. Great way to make use of those sunny, dry spaces under the eaves! I went with succulents, so I only have to water them once a week or so. We gardeners have to find ways to be creative, don't we? Yes! I was going to go with succulents too, but my husband wanted to grow his peppers there. So far, they're doing great. I need to do something like this for my pots. I've been lugging waster to them every couple of days, but not consistently. They definitely need more. That was our problem last year. It gets to be too much when you have to water them twice a day during a drought. I hope to have a drip irrigation and greenhouse one day. Maybe my next house. Blossom end rot is caused by a calcium deficiency. Add lime or even instant non fat dry milk. This will do the trick. Your soil is very important. Thank you so much for posting this and for using some of our products we sell at Lowe’s! We are a small manufacture in central Florida, yes that’s right a USA Manufacture and we always get so excited when we see someone happy with the results of using our Mister Landscaper irrigation. We are so grateful for your post and thank you! You’re welcome. 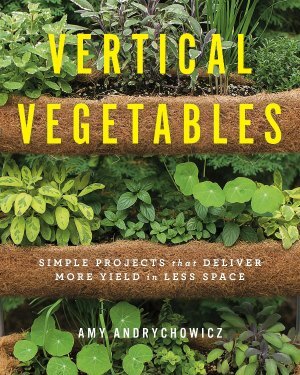 It’s a great product and we plan to add more to our garden this year. when are you coming to my house to help me set this up? 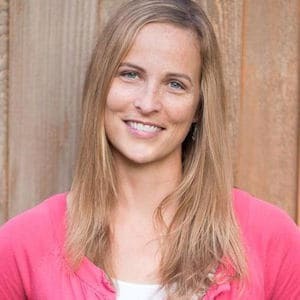 Haha, good one Kara! 🙂 It’s easy, you can totally do it! Very good blog!! Well written! Now if you find a way to capture rain water from a greenhouse roof, and then hook up drip irrigation for inside the greenhouse at ground level, I would love to hear any suggestions. Thanks. People used to install reservoirs on their roofs to help with water pressure for indoor plumbing. I don’t see why you couldn’t use a similar technique here. Install gutters to collect the water and then direct it into a large holding container suspended from the ceiling (perhaps a large plastic bag? You could also use two containers, one for each side of the roof. 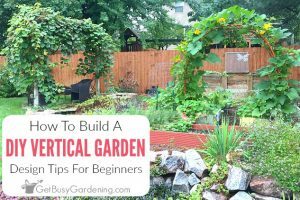 It depends on how big your greenhouse is and what kind of containers you can buy or repurpose.) This system uses gravity to drain the water through the drip hoses onto the plants. The holding container would be to make sure the water is evenly distributed. I haven’t done this myself, it’s just an idea for how it might be done. You’d have to do some experiments to figure out if the water pressure (which in this case is a factor of how much rain fall and how high above the plants the water tank is) was sufficient to run the system. My guess is that most of the water would come through this way, and the last bits wouldn’t have enough force to come out of the container. If you want to make sure to capture every little bit of rain, you’ll need to set up an alternate storage device for overflow. I think the easiest would be to see where the water flows out of the gutter when the system is over full and put a down spout under that point so that the overflow is directed into a rain barrel or something. This might not be necessary if you don’t get really heavy rain storms. I don’t know if this brainstorming is useful to you, but good luck with your project! How much does this system cost per pot approximately? I currently have two soaker hoses on a timer but the only place in our new rental with sun is a driveway. If you start with a kit, it will tell you how many pots it waters. I didn’t keep track of the price of ours, but it wasn’t very expensive. I’m not sure which part to envy the most – the drip irrigation or the greenhouse! Drip irrigation would be a lot easier than dragging 100 feet of garden hose. Haha, thanks! Yes, having a drip irrigation system has been SO MUCH easier for me! I’ll have to give this a try. Last year I planted tomatoes and peppers in pots and they did not do so well in South Texas. It was so hard to keep them watered. Yes, this will be much easier for you for sure! Thanks for stopping by! You guys have done a good job. I have a suggestion though. Rather than puttibg the drip line/ main line from front, it woukd have been astehetically more appealing if it was laid from the backside. So that you won’t see the pipe work and still get your plants watered. Thank you for sharing your drip irrigation experience. If I use the smaller kit you linked to, what else do I need? Just a pressure regulator? It comes with a “backflow valve”. Is that the same as a backflow preventer? They also recommend a faucet filter. Is that necessary? Since it uses 1/4″ vinyl tubing, do I cut it with some other tool? Or is there no cutting involved? Also, where in that chain does the timer go? Humm… when you say “drain pipe”, do you mean the mainline tubing? You can run it up along the side of the deck (or whatever you have it hanging on) to hide it. You can use 1/2″ tube straps to attach it to the wood, or use zip ties if that would work better. You can try plugging the leaky holes with the goof plugs and then punching new holes. Otherwise, if that doesn’t work, I would cut out the section of the hose where the leaky connections are, and replace it with a new piece. Use coupling fittings to connect the hoses together after you cut them. You could also look at getting a drip irrigation repair kit. That might be cheaper to buy than getting each piece you need to repair and expand your drip system individually. Great idea I have got to try this. I have flowers all over my yard front/back and side to side in pots and in the ground although I have sprinklers I don’t like wetting the leaves on the roses or other flowers in bloom. I’m going to go for it! Awesome! I love my drip irrigation system, it’s made keeping my plants healthy a breeze! Good luck, and have fun installing your own! Thank you for the great tutorial! What would you suggest if my pots are in a greenhouse very far from the spigot on the house? I currently run several 100 ft of hose out there and water by hand, but would love a set up like this! Can I just add the parts you have at the spigot, to the end of the hose and go from there? I use a 1/2″ poly tubing for the mainline irrigation hose (the hose that I buried under the mulch in my photos), and the 1/4″ micro tubing to hook the drippers up to the mainline (the tubing that runs from the ground up into the pots). Hopefully that makes sense. I am in need of advice in how to winterize this lovely self watering system. My longest tubing runs a good 80 ft with the smaller lines going to individual plants along the way. Can I remove the individual small lines from the 1/2” tubing and try to gently blow out the tubing and then hopefully reinstall the small individual tubing again next year? 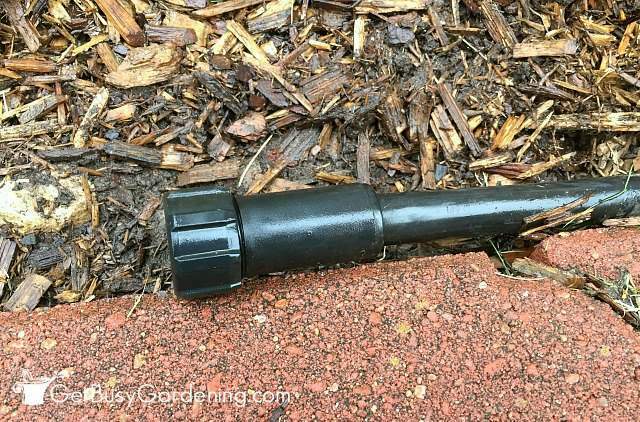 Yes, removing the drip lines and unhooking it from the spigot will probably work if you live somewhere with mild winters. But if you live somewhere with harsh winters (like ours here in MN), then I recommend pulling it up, draining it, and then bringing it into the garage or a shed. That’s what we do with ours. And if you do that, then you don’t have to worry about removing the drip lines, you can just leave it all in once piece. Great work. Keep it up and wish you many more contributions in the field of gardening. Just an idea. You could run those lines up through the bottom of each pot. 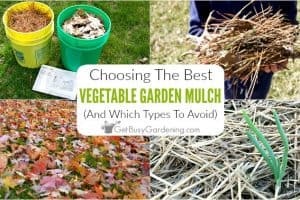 Just bury the hose under mulch and run it up through the drainage whole in the bottom of the plant. Run it all the way up and put whatever type of fitting you want on the end. That way you won’t see any of the hose only the fitting at the end. Haha, thanks! We usually run the drip lines up the back of the pots to keep them hidden, but I wanted them to be showing for the purpose of the photos on this post. 🙂 I do prefer to keep them outside of the pot, rather than running the drip lines through the bottom of the pots. I need to move the pots inside during the early fall frosts, and having the lines in the pots would make it more difficult to move them inside and then back out.